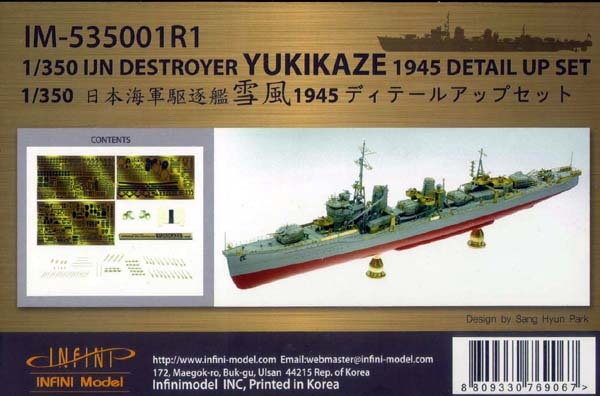 Designed specifically for the Tamiya kit this new set from Infini Model will help you build an accurate version of the ship. The set includes three main photo etch sheets with one bonus sheet, over 100 CNC turned Brass parts, new propellers, nameplate, and rigging giving you the ultimate upgrade. Eighteen gun barrels are included for the Type 96 triple 25 mm gun mounts. These are incredibly detailed with finely machined ridges simulating the coils and nicely flared and drilled out ends. The two larger parts shown below are new pedestals for the middle gun platforms. Forty gun barrels are included for the Type 96 single 25 mm gun mounts with pedestals are included. Equally as detailed as those shown above, these are turned as one single part. You can separate them by snapping or cutting them at the joint. New yardarms are machined with a narrow center section to help with locating and mounting. A new Jackstaff and flagstaff are included for proper flag mounting. Note the ends machined to simulate the ball tips. Cable reels are common in many companies upgrade sets, but how many include machined drums. Some are machined with grooves to simulate coiled hose or wire. New center sections for the depth charge cans will look great when the PE end plates are applied. New ends for the cranes and davit posts will give them a more finished appearance. New 5" inch main gun barrels are also included. A new set of brass screws look better than those included in your kit. The first fret includes the type 96 25 mm gun mounts both single and triple styles, ammo boxes, depth charge racks, ends for the depth charges, and a new splinter shields just to name a few items. The second Fred includes custom railings, braces, ladders and foot rails, girder work, funnel foot rails, platforms with diamond play tread detail, inclined ladders, and cable reel assemblies. There are many more details please refer to the photos and instructions to see what I haven't mentioned. New railing with drooping chain custom fit to match the kit, boat davits, new platforms, many with diamond plate tread pattern relief etched on the surface. Linoleum supports are custom cut for each section of deck. I really like the way the platforms have the splinter shields attached to them. Fold lines are etched on and all the modeler has to do is end them up and glue them. This is much easier than trying to fashion a separate splinter shield to the platform. The fourth fret is included with some optional platforms and railings. These platforms have panel lines relief etched onto the surface. Some of the railings include netting along the bottom. I'm pleased to see that Daniel Kaplan provided input on the design of these parts. His expertise complements the design work of the SH Park. This optional fret include its own instructions sheet. An appropriate name plate with an antique look is provided as shown. 10 meters (32') of black Lycra rigging thread is included for that final finishing touch. A 12 page set of instructions is included to help you assemble the parts. Many photographs are included showing not only the plastic parts that you replace but also the new parts located in their place. These are very well drawn and leave little to the imagination. Hyun Soo Kim used this set in his buildup shown alongside the demo kit. This may well be the most accurate upgrade set for this ship. It is well engineered and addresses all the weak points of the plastic kit. It has everything you need to take your kit to the next level. Highly recommended. This is an in-box review showing the kit contents. We welcome your input and comments in the review section of the forum. Click the logo on the right to join in the discussion.